Over the last few years, the trade press has run articles about the uninspired designs of US coinage. The 50 State Quarters Program has seen reviews from fantastic (the Charter Oak of Connecticut) to scary (the hanging astronaut of Ohio). Recent portraits of Thomas Jefferson on the Return to Monticello nickel and Benjamin Franklin on the commemorative celebrating his 300th birthday are so bad that they are barely a representation of the person being honored. One country that does a great job with its coinage is Canada. Since I started collecting Canadian coins two years ago, I have been studying their significance and admiring their designs. 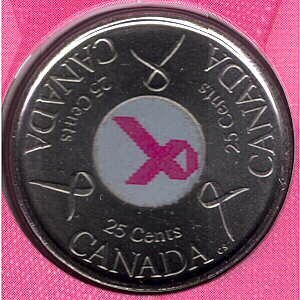 Recently, the Royal Canadian Mint (RCM) issued the 2006 25-Cent Circulation Coin Creating a Future Without Breast Cancer. The coin’s reverse features an enameled pink ribbon in the center surrounded by the engraving. The obverse is the common design featuring HM Queen Elizabeth II. It is a simple and elegant design that is well executed by RCM. 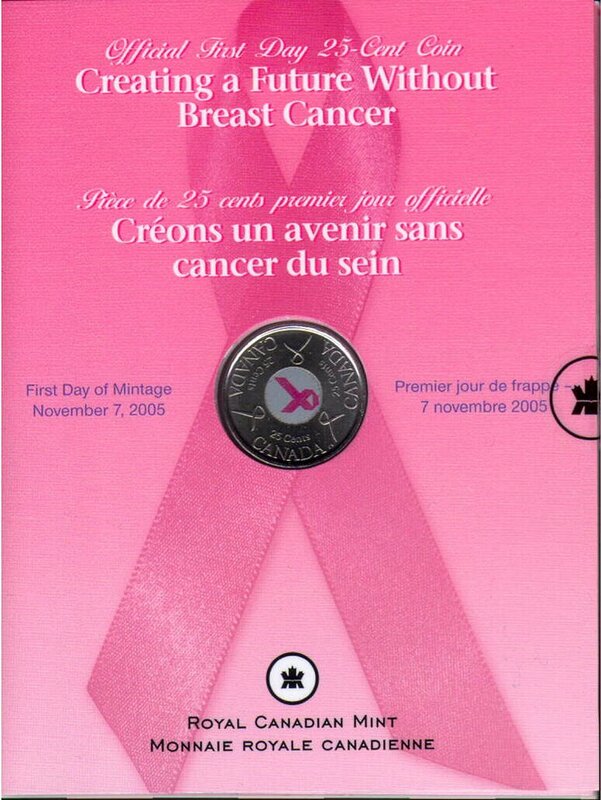 This campaign puts 30 million coins into circulation to support the work of the Canadian Breast Cancer Foundation. 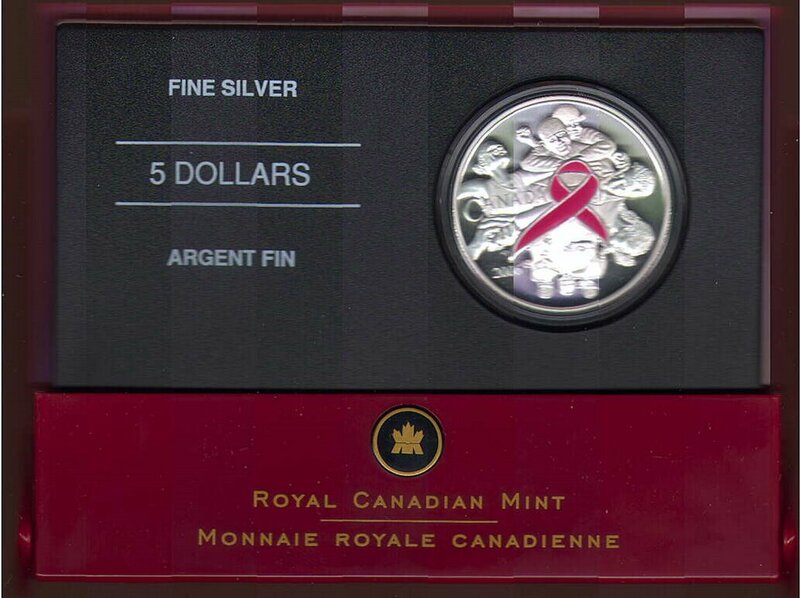 RCM sells this coin in several collectible forms. My purchase included the first day of mintage card. This card is tri-folded with the coin encapsulated in the center. Inside, it explains the campaign, the hope for a future without breast cancer, and that part of the proceeds will go to the Canadian Breast Cancer Foundation to support their programs. It is a beautiful collectible in support a worthy cause. 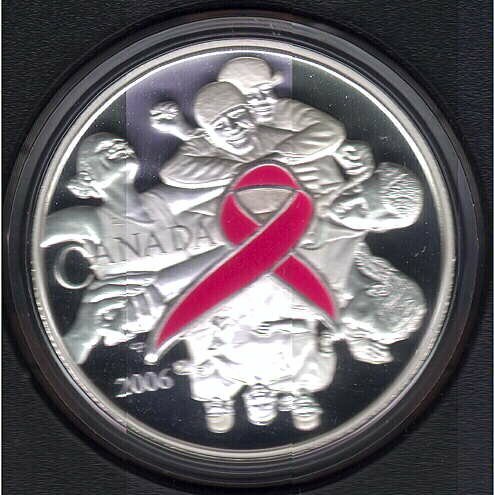 I also purchased the 2006 CAN$5 Special Edition Proof with the pink enameled ribbon on the reverse. According to the RCM website, “Its inspiring design reveals the many fronts working to create a future without breast cancer. A special “enamel-effect” combined with pure silver creates a powerful statement of hope that will enrich any collection.” When I received the coin, my reaction was “oh wow!” It is beautiful, well executed, and a true inspiration to the cause. In my last two years of starting a Canadian coin collection, I have seen the RCM issue beautiful coins on a variety of topics. Although I do not yet know the process the RCM has to undergo for permission to produce these coins, it is obviously not the politically charged process that the US Mint has been tied to for over 200 years. I will investigate the Canadian process and compare it with what we have to go through in the US to see why Canada seems to issue more inspiring coins.